Yesterday was Women’s Equality Day. On that day, in 1920, American women were granted the right to vote. The name is a bit of a misnomer–being able to vote didn’t automatically result in equality–but it was a step in the right direction. There were some incredible people, like Susan B. Anthony and Elizabeth Cady Stanton, who fought a long, hard war so that you and I could cast our votes and have a say in the decisions of our country. Both those women died before they could see the victory they’d fought for. I’m sure there were days when they thought they were Don Quixotes, battling windmills that would only keep turning. No doubt they had moments when they were sure their hard work was in vain. It took an exhausting length of time and hordes of dedicated people to make it happen. It wasn’t easy. It wasn’t fast. But I bet they’d tell you the battles were worth the victory. Sometimes, Bridget, the most important things in your life require a long fight, battle after battle. There will be days when you’re so exhausted, so tired of striving, you’ll doubt whether you can keep fighting. But you may be only inches away from a victory. And even though your efforts may seem to disappear into a void, you don’t know what’s around the corner or how your actions may impact someone else. Anthony and Stanton didn’t know me. They died decades before I was even born. But I bet they imagined me, imagined women in the future who would cast their votes alongside their male peers, their voices bearing equal weight. Their struggles resulted in my right, one I try to never take for granted. There may be things you do, Bridget, actions you take that will have results you won’t be able to see. But that doesn’t mean they’re in vain. And there will be other victories you can see, but they may arrive only after a tiring battle. But no matter how many battles you fight or what you strive for, the most important battle you will ever fight is one within yourself–the battle for hope. Because if you lose that battle, it really will be in vain. If you look around at this noisy world and start to believe your voice is insignificant, that your dreams aren’t worth the effort, then you’ve laid down your sword and surrendered. Don’t surrender, Bridget. Hold fast to hope. Never let it slip from your fingers. There are legions of people, ones who know you and ones who’ve never met you, who believe in your ability to achieve something great. But they cannot fight your battles for you. So lift your sword, Bridget. And don’t you dare surrender. What’s Dear Bridget all about? It’s a series of letters to a hypothetical teen girl named Bridget. Why Bridget? It means strong. And it represents the current generation of young women. These letters are my attempt to break through the chaos and the crap that’s flying at today’s young woman in order to offer advice and encouragement, from me and other incredible women who remember what it was like to be in her shoes. If you’re a teen girl and you’ve got a question or issue you’d like us to address, let me know. Just click on the contact button (that round envelope icon at the top of the sidebar) and send me your thoughts. If you’re an awesome adult woman who remembers those teen years clearly and would like to write to Bridget, feel free to contact me and tell me about yourself. Have you ever heard of The Storymatic? Sounds like a weird-looking tool, like something you throw ideas into and grind up to see what happens. That’s the basic concept, but in a game/writing prompt format. The box holds two sets of cards: gold and orange. The gold cards are ideas of characters, the orange cards are places or situations. All right. 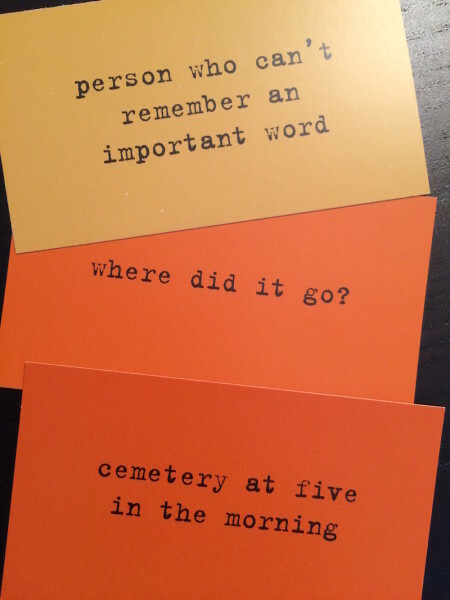 A person who can’t remember an important word – lots to play with there. Something that is lost or in an unknown location. And a cemetery at five in the morning. And since I write mysteries, you know it’s gotta have a dark twist. It wasn’t as if Ingrid expected to find signs of life in the cemetery. And at five in the freaking morning, not even the sun was awake. Awesome. She just wanted to get this over with. “Marcus?” She hissed the word into the darkness. Like it was going to bother the dead. This old cemetery was so neglected, the living barely even saw it any more. The only humans ever here were the ones six feet under. Except for her. She of questionable sanity. She followed the voice through the darkness. Why was it she’d agreed to this? Oh right. Because Marcus had some theory he wouldn’t shut up about. Body snatchers or something. Agreeing to meet him here was the only way she could get him to promise to let it go. Her foot caught on something and she fell, her arms flailing into the darkness. A sharp pain spread through her skull moments before everything went completely black. When Ingrid awoke, the sun still hadn’t bothered to shine. She could thank the clouds for that. The faint light was gray and dismal, casting the overgrown cemetery in murky shades like a black and white movie. A groan pulled her attention to her left. Marcus. Oh no. Slumped against a tree, he had a hand pressed against his stomach, blood coating his fingers. Ignoring the pain pulsing behind her eyes, Ingrid crawled over to him. “Marcus! What happened?” So much blood. How in the world was she supposed to stop it? She pressed his hand against it, hoping to help slow the flood. Blood covered her hands, smears of it on her shirt now. Where was her phone? She needed to call for help but her phone had vanished from her pocket. “Stabbed? Who stabbed you?” She glanced back at where she’d fallen. No phone there either. His face wrinkled, his mouth struggling to find the word. “Yes? What is it?” She could hear her voice growing shrill, her breathing turning ragged as the smell of blood overwhelmed her. Lifting his free hand, Marcus pointed. Ingrid turned, attempting to follow the angle of his finger. But then she realized he was pointing at her. And suddenly she knew. The word he was struggling to remember. One simple word. Three letters. So. Readers. How’d I do? What kind of story would you write with those prompts?